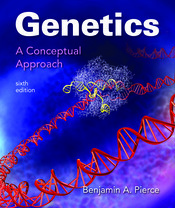 With Genetics: A Conceptual Approach, Ben Pierce brings a master teacher’s experiences to the introductory genetics textbook, clarifying this complex subject by focusing on the big picture of genetics concepts and how those concepts connect to one another. The new edition continues the Pierce tradition of pedagogical excellence and scientific currency. In addition, it features a new digital component, SaplingPlus, combining Sapling’s acclaimed online homework with an extensive suite of interactive learning resources and course management features.